6 foot tall, tall legs, just turned 40 and divorced, trying to get in shape (over 200lbs, not looking to spend big bucks to shave off a few grams). Karate, weightlifting, up to 7 mile runs (may hit 20 towards the end of summer), but the wear/tear is taking a toll on my body and I am hoping some time biking can cut down on that while still getting exercise. Rode 100+ miles all over in groups or alone as a teenager, but mostly replaced with running and motorcycling as an adult. Have a mountain bike (needs tires) but was thinking of buying a nice road bike. 17 miles one way to work, mostly flat with paved bike trails, I'd like to try to bike but need to make it carrying a laptop without breaking a sweat, relaxed dress code. 30 miles to my parents, brother and nephew. I did a few short triathlons, and might want to get back into that, but can't swim at competitive race speeds (and may or may not be able to learn). So something that isn't a severe disadvantage in a local race (like a 20 year old mountain bike), but if I get serious about triathlons, I will get a race-only bike. I intend to keep the mountain bike so I am not looking for a cross. I have no idea on budget, but preliminary research says anything under $600 is junk and over $2500 is diminishing returns, and probably towards the lower end unless there is a reason to go up. It's been a long time since I looked for a bike, and even longer since I actually bought one, and I am a little overwhelmed. Carbon forks? Disc brakes? So many brands now. And I suspect I can find better deals online like everything else. Have you visited any of your local bike shops? What are the selections in your local area? We can suggest bikes, but if it is not available in your area, it will do you no good. Last edited by tagaproject6; 05-10-18 at 12:48 PM. Carbon forks , Yes. Disk brakes.... probably not on a flat area as you describe! I plan to make a few stops, but was hoping I'd be able to buy online. Retail stores overwhelmingly cater to the sub $200 ride-around-the-block crowd. I don't see why I can't figure out sizing from online and think I'd save a few bucks doing it that way. If I had a store I worked with and trusted, it would be different, but having a random retail store screw up sizing seems more likely than screwing it up myself. Any opinions on either the Kestrel rt 1000, Kestrel Talon or carbon frames in general? They seem comparable in price to the nicer aluminum bikes, have a retailer in the area and seem to have some good deals online too. Or am I better off with aluminum? I can upgrade seats, brakes, most anything else - but upgrading a frame is buying a new bike. The area I live in is hilly, 200 feet elevation change up and down the Cuyahoga river valley with smaller rolling hills around. The specific trail to work is relatively flat for the area, which is very important biking to work without breaking a sweat. I am not going to ride this anywhere the mountain bike would be more suited. Stopping power probably isn't important. Last edited by bvbellomo; 05-10-18 at 01:59 PM. Can't help with bike selection as it's a more personal choice, but my commute is 16 miles each way to work, and I cycle it 3-4 days a week. Depending what bike I take, my laptop either goes in my backpack or panniers, with a change of clothes. I keep deodorant and a pair of shoes at work. I wear cycle-specific clothing (ie lycra) for my commute. There's no getting past the sweating unfortunately, even when it's 27*F.
I plan to make a few stops, but was hoping I'd be able to buy online. Retail stores overwhelmingly cater to the sub $200 ride-around-the-block crowd. I am not referring to retail stores. Regular bike shops, usually mom and pop, small business type stores that only deal with cycling. There are quite a few bike brands, like Specialized, Cannondale and Trek that do not do online sales, and if they do, you usually have to go through a bike shop. Panniers are also something worth considering that I'd use often. A change of clothes after a light sweat might be acceptable, but am surprised you can't make 16 miles without breaking a sweat in 27F (did you mean 27C)? I typically won't ride below 35F as I've wiped out on ice too many times. Craigslist brought up a 3 bikes, great components for the price, 2 carbon, 1 aluminum from 1999. All are 55cm, which is probably a little small. Buying used means I get to try it first, but it also means the seller likely pressuring me to buy even if it is the wrong size. If you have any Performance Bike store or Giant retailers near you, check them out. I was looking for a sub $1k bike earlier in the year and those offer very good options because they don't tack on a lot of brand-name premium to the prices on their bikes. You can do a flat trail commute without sweating much, but the trick is to wear less than you think you need when setting out to deal with your body warming up later in the ride. Once you get used to it, you can even do rolling hills without breaking a sweat if you go a couple mph slower. I've been doing a 17-mile one-way commute with a little under 1000 ft elev gain and added 4 mph to my speed since I started in February. I've recently been commuting with a co-worker who hadn't ridden in a year, so I know for sure that cutting back those 4 mph makes the sweating all but stop. I'm 4 years younger than you but never really done any endurance exercise, so probably have less overall fitness than you. Buy a bike that fits and you'll do great. Go to a bike shop. They should be able to help you with fit, and other minor adjustments, as well as usually free after sales service for a year or two. Pretty sensible price range. Also, look at bikes built not just for pure speed, but also have clearance for tires 28 mm wide or wider, and braze ons to mount racks and fenders if you plan to commute in bad weather. Local bike shops are the way to go. I have eight outstanding shops in my city. Oops, make that nine. Nope, meant 27F (-4C). I'm still working pretty hard, and I tend to run hot anyway. It was 5C (don't feel like doing conversions atm) when I left my house this morning, and I was in shorts and a light baselayer on my top half. If it's been cold and dry, I have no issue being out when it's that cold. It's when everything's wet that worries me. Plus, cycling when it's that cold is still warmer than than taking my motorbike. Luckily, we don't see those temps to often in the southwest UK, and we mainly hover just above freezing in the winter. So I pulled the trigger on a 55.5cm aluminum Giant TCR from 1999 - appropriate as that is probably the last time I was in good enough shape to deserve a bike like this. Great shape for a bike this old, and I haven't found any non-cosmetic issues, super-light, smooth and accelerates quickly. I am starting to see why disc brakes are popular, and miss my motorcyle's braking, not an issue on trails and back roads and will be fine once I am used to it. Really like this bike, but needs some help with the fit. Played around some today, but it was cold and rainy all weekend, so I will play more when it is nicer. The previous owner was 5'10" with a 32 inch inseam, I am 6' also with a 32 inch inseam. He had the seat all the way up, not sure how he rode like that. Lowering the seat, my arms still feel a little stretched out. I understand this is supposed to be an aggressive riding position and will get more used to it, but would appreciate moving the handlebars either higher or further back to relax it some, at least initially. Giant listed this model as having an adjustable stem. I haven't tried to loosen the stem at all, but don't see how to adjust it, not even certain if this is the original stem. Not sure on proper seat height. The old test we grew up with as kids was your feet (or at least toes) should be able to touch the ground. But the more professional advice seems to be to raise your seat as much as you can without your feet having issues with the pedals at the bottom. Might try a higher seat, but that will make the handlebar issue worse. Previous owner advertised the bike was recently tuned up, and it still had the tags from the store on it. I suppose they could have adjusted it (or at least the seat) from how the owner was riding. I tried to post an image of the stem, but this forum won't let me until i have more posts. It is a quill stem, and might be as simple as loosening the top bolt, sliding it up and tightening it up again. I really want to be a jerk about how a local bike shop would've helped you with the fit and sizing. Seriously though if you don't know much about bikes take it to a shop--you should have the mechanical condition of the bike assessed, and they can help you with fit and sizing. Fit always starts with getting your saddle position correct relative to the bottom bracket. Rule of thumb is to look for a 30 degree bend of the knee at the bottom of the pedal stroke with the foot parallel to the ground. Fore-aft rule of thumb is to have your knee roughly over the pedal spindle when the cranks are perpendicular to the ground. This is a good place to start, but particularly with the fore-aft, the ideal fit for your varies on the actual proportions of the body and how you ride to some degree so is just a starting point. Without seeing you on the bike it's hard to tell if you are simply unused to a forward body position typical of road cyclists, or if your position on the bike is genuinely working poorly for your body. Lower, to a point, will generally recruit muscles better, and lower will always be more aerodynamic, but too low can require that the angle between the femur and the torso becomes more acute than your body is flexible for, require excessive neck strain, place too much weight on your wrists, etc. Generally speaking also the greater the power output, the more comfortable a low position will feel and vice versa. If you have a quill stem you can loosen the stem expander bolt and bring it up--mind the minimum insertion mark. You also may find it worthwhile to install more contemporary, compact handlebars that typically have a flatter transition to the hoods, less reach, and a shorter drop. They really are a lot more comfortable for most riders. You may need a different stem to achieve the ideal fit. Good luck and enjoy the new bike. Mostly it is that I am unfamiliar. Beyond my parents teaching me how to ride without training wheels, I've had no help. And there was no Internet, forums or Youtube videos back when I was riding thousands of miles a year. And right now my muscle memory is based on motorcycles and mountain bikes. I thought I was riding too low last night, but 30 degrees is more knee bend than I thought I'd want, so maybe I am closer than I thought. Most bike stores will offer fitting, however this is very expensive relative to the cost of the bike, and also doesn't allow for transition. If a mechanic gives me perfect fit, it will be really awkward for a while. What I need to do is adjust the bike to how my body and muscle memory are currently working. For example, if my saddle is way to low, raise it a quarter inch a week, rather than setting it where it should go and falling on my face every stop sign. Above all else, I need a lot riding, preferably where there are no cars or pedestrians to hit. I need to learn how my body fits on my own. It depends on the shop. Most good fitting services involve follow up, but I agree that they can be expensive. I'm mostly suggesting you could be quickly served by a reasonable, sanity-based fit as a starting point. Also your pedaling position should be mostly similar for mountain bikes and road bikes. 30 degree bend of the knee feels pretty extended. Basically if your saddle is too high you won't be able to spin as smoothly and your hips will begin to rock and cause lower back pain. If your saddle is too low your power output will be lower and it can cause knee pain. at 6', a 55cm is probably too small. You can probably make it work -- especially for commuting purposes -- but you probably want to use this bike as your learning-what-you-need platform for when you drop ~$1850 on your 58 cm CAAD12 105 with disc brakes in the fall. That Giant TCR is a good bike, but there are lots of things you will have to upgrade in order to make it anywhere near being competitive and buy that time the long and the short of it is that you will spend $400-$500 on a new groupset. Second hand is best and you should be able to get an Ultegra 6800 11speed complete groupset for that with a 52- 39 chainring set 11-28 cassette. You will also spend about $100 as it has a 1inch stem on one of these to get it up to speed with 31.8mm handlebars, https://wearefactoryfive.com/products/titan-stem or you will need a 1inch stem riser to make it to 1 1/8 stem such as this plus a stem. Then factor in $100 for a decent saddle. Then you can spend anywhere better $100 and $500 on a new set of bars. Then you will have a 20 year old road bike design which was worth about $300 originally and $400-$500 on a groupset getting you to $700-$800, and then another $100 on a stem, and then another $100 on a seat post gets you up to about, then add a new set of bars. You're looking at $1000-$1500 on a 20 year old Giant to make it competitive. Then you wouldn't really be on par with today's $1500 CAAD. You're over capitalising on a 20 year old bike... Sell it for what you bought it for and get a new bike unless you really know what you're doing. I want to be mean here and say that you don't but I don't know how you'll take that. You can ride an old ally bike, I do, I know what it does though. Those old TCRs ride really harshly, and the carbon forks don't do much to improve that. It's also harder to find carbon forks these days that will fit a 1inch tube that are new and I would not trust my life with second hand carbon forks. Unless you're a retro grouch like myself who knows what they're doing putting a frame together, or you know what you're doing save the TCR for someone else. It is a very highly desirable frame for the right person especially if its in the yellow and black Once [on-say] colors... but you do not seem like the right person for that bike to be honest. I would have spent the same money on the CAAD above which is a bike in the same category as your TCR but has about 20 years worth of extra development put into the frame. 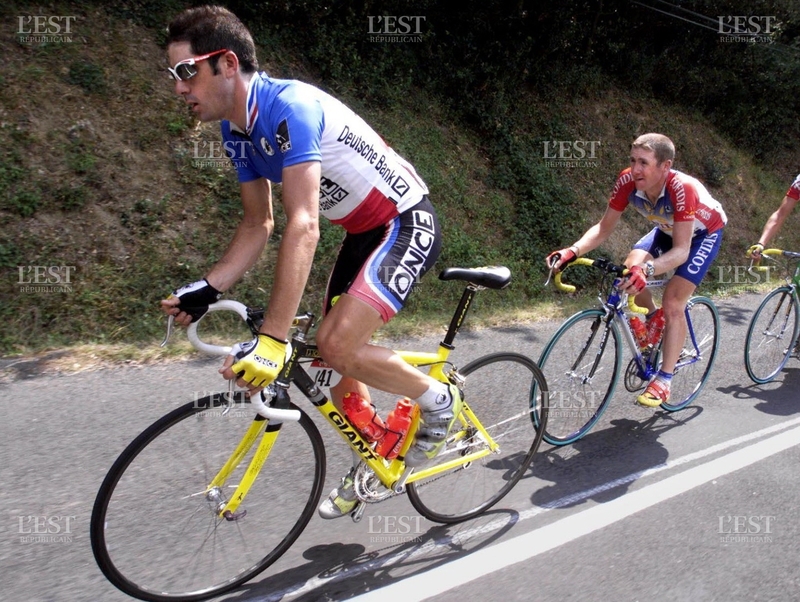 Now Back in 1999 this was the standard and Laurent Jalabert was still riding with a 1inch quill stem adapter. These TCRs aren't modern by today's standard in fact they're not modern at all. One of the main reasons I'm riding my 1500 now is getting over the hump and being on a modern bike platform I can still buy parts for through more direct channels. Don't get me wrong, it can be a seriously light bike with a frame down to 1100grams while some of the factory bikes went down to 900grams. The problem is they have an even steeper top tube pitch than a modern TCR and if you put the wrong wheels on the bike the whole thing can become unstable. Last edited by 1500SLR; 05-14-18 at 10:54 PM. I would avoid anything branded, or at least pro peloton branded, and get something from one of the online shops or China, made of carbon with good components. Carbon forks are good. Disk brakes have the advantage of not wearing out the wheels, so you can use lighter wheels, and or for longer.